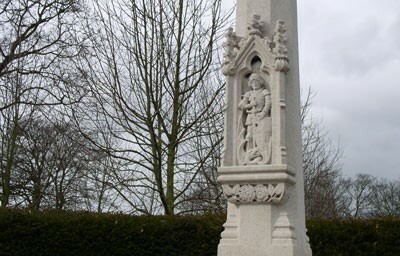 St. George and the Dragon – a detail on the Bishopthorpe War Memorial. It was carved by Robert Thompson of Kilburn to a design by Brierley & Rutherford. It forms a poignant reminder of the effects of tragic world events on this local community. It is a well-designed monument by a well-known architect, Walter Brierley. It is made of high-quality materials, executed with excellent craftsmanship. It has group value with the adjacent church, Archbishop’s Palace and other designated buildings. Its proximity to and historic association with the Archbishop of York’s Palace gives it added significance.